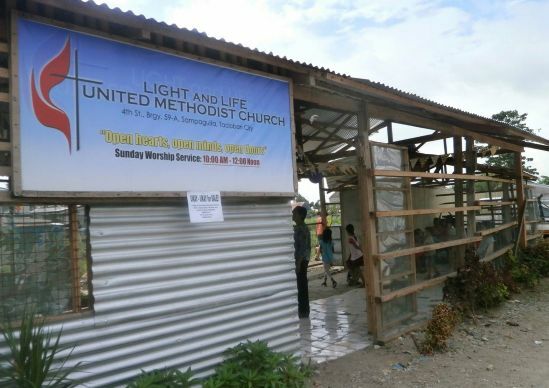 Life is moving on for members of a United Methodist church destroyed by Typhoon Yolanda, also known as Typhoon Haiyan. Many have returned to work, but others are still living in bunkhouses built for disaster victims. The Light and Life United Methodist Church is still using a temporary building a year after the Category 5 storm wiped out the city, said the Rev. Iris Picardal Terana, a Christian educator at the church who was serving as pastor when the storm struck. Picardal Terana says that there have been many blessings, too. One of those is the lot where the temporary church now stands. "We have seen blessings from this disaster, we have felt our global Methodist connections, we realized how God love us when we were reached out to by others whom we did not even know,” said Picardal Terana, who was initially thought to be missing in the storm. She also has faith that with continued prayer, God will provide a new church building. Picardal Terana, a deacon of The United Methodist Church, is charge of the children and youth ministry of the church. She is also part of the Eastern Waray Bible Translation Project which started in September 2014. Picardal Terana said in a telephone interview that many women are involved in job projects provided by the office of Bishop Ciriaco Francisco, leader of the Davao Episcopal Area, or through other United Methodist connections and non-government organizations. Further financial support from the government is unlikely, she said. The Department of Social Welfare and Development gave a supply of rice, noodles, and canned foods that was used up by August 2014. The six families living in the bunkhouses still get 20 kilograms of rice and canned goods each month from the department. Picardal Terana said storm survivors really appreciated the help they got from the Tzu Chi Foundation, a Buddhist organization. "Tzu Chi came and encouraged each one here in Tacloban City to clean up, just to clean up. . . even in our own surroundings,” she said. The foundation paid anyone who cleaned up debris 500 Philippine pesos, or about $11, a day. Another blessing that emerged from the disaster was rediscovering the Filipino spirit of caring for one another, she said. "By God's grace, we are still here, we think of others' losses, but we stay and we hold on, but if circumstances trigger the pains, the wound is still there,” she said. The Rev. Joseph Cornito, the current pastor of the Light and Life United Methodist Church, said the church participated in an ecumenical worship service on the anniversary of the typhoon on Nov. 8, 2014. Hundreds of Taclobon City residents attended. Cornito visits the residents of the 218 houses being built by the United Methodist Committee on Relief project in Calogcog. Calogcog has been the focus of UMCOR’s commitment to help the rebuilding of houses and village resources in the municipality of Tanauan in Leyte Province. It has concentrated on providing new houses for those who lost their old homes—and in the same locality rather than requiring families to move elsewhere. Using the “build back better” principle, the completed houses will have solid foundations, with an abundant use of concrete, to help them withstand future typhoons. He and the Light and Life church have also worked with projects to provide school materials and income-generating projects for the Pacao and Hinyangan islands. First Filipino United Methodist Church in Houston, Texas, donated resources for medical and dental missions, and also provided four pedicabs. Church members can earn and income by driving the small three-wheeled vehicles. In addition, each cab generates about 50 Philippine pesos or $1.20 a day ($1.20) for the children's Christian education and feeding program. Tacloban City is still a long way from recovery. Basic education schools only hold half-day classes because classrooms still need repair. In their local dialect, residents use the word "Tabangunon" to describe Tacloban City, which means "It needs help." Cornito said that although Tacloban City has not recovered, he has faith that God will continue to provide help. "Let us continue praying, that God will bless the hearts of people, that they will be able to see and feel what God is asking us to do - that survivors need to be understood and need to be listened to, that the survivors need food, a permanent house not a bunkhouse, and that they need to move on and have life."